A distinguished academician, visionary and an expressive philosopher, with four decades (43 years) of specialized experience in education domain, administering training of teachers, academic management, curriculum development, operations management, and multimedia amalgamation. 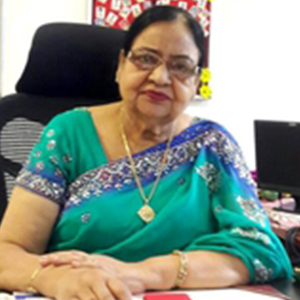 After completing her education in MA & B.Ed, she started her career as Lecturer in Government Higher Secondary School, Ludhiana and with a vision to start a school in the tri-city. She successfully embraced best practices in Gian Jyoti Global School for holistic development of students, staff and school. Appointed as Mentor for 21 schools of tri-city by CBSE board. Nominated as Observer for CBSE examination and Centre Controller (part of inspection team for giving CBSE affiliations to the schools). Felicitated on World Teachers Day (05th October 2007) on the occasion of Gyan Jyoti Samman Samaroh, by Amar Ujala and Indo Global Colleges.